Coconut oil has been gaining a lot of popularity in the fast growing community of health conscious people. People in Asia and the Pacific Rim have used coconut products for thousands of years. They drank the milk, ate the flesh, turned the tree sap into sweet syrup, and weaved baskets with the leaves of coconut trees. In the 1950s, coconut oil, which you receive when you press the meat of the coconut, could be found in every household. With the low-fat craze that swept through the Western world, coconut oil gave way to margarine and vegetable oils. The “experts” demonized saturated fats. People touted highly processed vegetable oils as heart-healthy, but only in very small amounts. Fortunately, coconut oil is seeing a comeback of epic proportions. From slathering your baby’s bottom to cooking up some fabulous-tasting eggs, coconut oil is making its way to the top of the charts. How about putting some coconut oil into your morning cup of coffee? Of course, those who have been using coconut oil for years never truly believed the lipid hypothesis that said saturated fat was bad for us. More and more evidence is being uncovered to say just the opposite. Coconut oil is a medium-chain fatty acid with a high saturation level. The main fats in coconut oil are caprylic acid, lauric acid and capric acid. Most fats take much more effort from the body to be digested (26 steps), whereas coconut oil is digested much easier (3 steps). Because it is a medium-chain fatty acid, coconut oil is processed by the liver, so it is converted into energy rather than stored as fat. Coconut oil is a solid at room temperatures and it has an amazing shelf life due its saturation. It is also an ideal oil to cook with because medium-chain fatty acids are much more stable and will not break down during cooking. Healthy saturated fat is not only good for us, but essential for numerous bodily functions. Did you know that more than half your brain is made up of saturated fat? Coconut oil is described as one of the healthiest saturated fats on the earth. Coconuts are revered by people all over the world for their amazing medical and nutritional properties. They have been used for ages by diverse cultures and races, all of whom respect the magnificent qualities of this tree-growing nut. Fortunately, the Western world is quickly catching on. Now there are even numerous studies supporting some of the health claims that so many of us already know to be true. In traditional medicine, people use coconut for a wide number of health problems. These include kidney stones, nausea, rash, scurvy, infections, wounds, asthma, colds, constipation, cough, earaches, fevers, jaundice, kidney stones, lice and ulcers, to name a few. Modern medicine is finally coming alongside traditional medicine and echoing the amazing health benefits of coconut. Published studies in a number of prominent health journals note the benefits of various forms of coconut. Several studies have confirmed that coconut oil has the ability to increase the good cholesterol HDL. In other studies, women and men were fed a diet containing coconut oil and butter. Researchers found that coconut oil increased energy in study participants and was able to help with weight maintenance or weight loss. What is even more amazing are the results of a study of women with stage III and stage IV breast cancer. The 60 women were fed a diet containing virgin coconut oil and experienced an overall improved quality of life. Coconut oil also reduced the side effects of chemotherapy. As you can see, saturated fat isn’t necessarily the bad guy, when it is from a good source like coconut oil. The lauric acid in coconut oil can actually prevent high blood pressure. Below, find a list of other proven health benefits of coconut oil which will make you want to run to the store and stock up on this amazing fat. The brain produces its own insulin in healthy people. In people with Alzheimer’s disease, this function is limited or stopped. The ketones produced through coconut oil consumption increase energy for people with Alzheimer’s and can help improve brain function. A study conducted in India found that the antioxidants in coconut oil were able to reduce inflammation in study participants when taken regularly. Researchers have also found coconut oil to be of great value to people with arthritis. It is the lauric acid present in coconut oil that has been credited with helping treat parasites, like candida. It is necessary to use coconut oil on a daily basis and usually several times a day. The liver processes coconut oil, so it provides a quick boost of energy and endurance. This makes it extremely valuable for athletes, especially those needing a lot of energy for longer workouts. The antioxidants in coconut oil can slow the aging process, as stress on the liver is decreased and detoxification is increased. The antioxidants in coconut oil fight free radicals and reduce oxidative stress, both of which count as the main culprits for osteoporosis. Additionally, coconut oil increases calcium absorption. Researchers have found that bone loss due to osteoporosis decreases in patients who take coconut oil regularly. Replacing processed coffee creamers with organic coconut oil is a smart move. Although it may sound strange, the result is actually quite delicious and highly nutritious. The combination of caffeine and saturated fat gives the body a lasting energy boost. Prepare a tropical twisted coffee drink by brewing a high-quality organic cup of coffee and place it in a blender. Add in one tablespoon of organic coconut oil, blend and enjoy. Add coconut oil to your coffee for a great way to supercharge. Give your body a burst of energy to make it through the day, not to mention all of the other amazing health benefits of coconut! 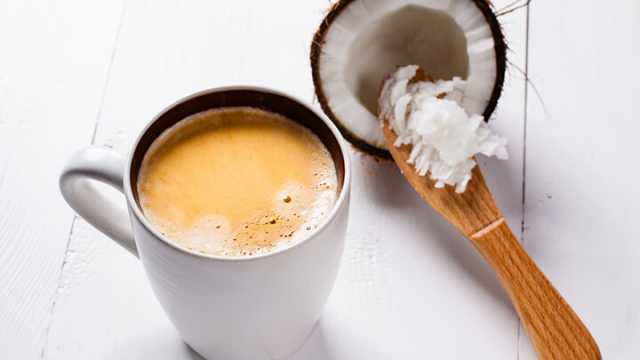 Hey Buddy!, I found this information for you: "Coconut Oil In Your Morning Coffee? Absolutely". Here is the website link: https://www.thealternativedaily.com/coconut-oil-in-your-morning-coffee-absolutely/. Thank you.